I have been bleating on about Setapp on this site for a while. 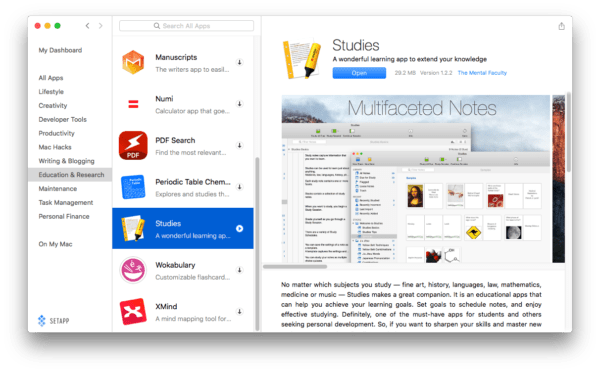 Whether it is for accessing a suite of apps for all of your academic work, keeping it together with time-management, or just taking care of your Mac. The service recently passed the 100 mark for their collection of apps. The chances of not finding what you need in their library are becoming slimmer all the time. If you’re a developer, a writer, a tinkerer, or a so-called productivity enthusiast. Setapp has you covered. And, they’re adding quality apps all the time. One of my early concerns was how unruly it might get if they didn’t exercise decent quality control. MacPaw appears to be acutely aware of that possibility. The software that winds up on their books is not only throughly vetted, but somehow they are attracting numerous best-in-class developers. It looks a good deal regardless, and yet there are ways to get more from subscription that you might realise. Among the many balancing acts for a developer is how to handle trial versions. Do you hold back features, limit the access time, or make it impossible to save project? With Setapp everything is standardised in that regard. The first month is free for all users, and there are no conditions on the apps. After a month you can add your payment details if you want keep using the suite. You won't find in-app purchases for unlocking premium features, at any time. The Setapp versions come fully loaded, primed for every update and added feature. That is the deal. You can test apps without the caveats. One of the many advantages to this model isn't immediately obvious. If you're anything like me, there might be a few apps you would like to have available just in case; but buying them outright is difficult to justify when you hardly ever open them up. For example, Setapp includes things like Disk Drill for data recovery, WiFi explorer, and many more maintenance utilities and digital life savers. These are the kind of utilities that make me cringe at checkout, which are invaluable when you need them. For writers, there is another more salient example. Ulysses has been part of the suit from the beginning. When they recently switched to a subscription model, I didn’t immediately realise they had worked out a way to include their iOS apps with the Setapp subscription. But they have. In fact it kind of irked me that I would somehow be paying for the app twice, but I wasn't paying attention. If you have a Setapp subscription, you can use it to activate Ulysses on iOS. I have no trouble understanding the disdain for subscriptions that some users have, especially at the individual app level. 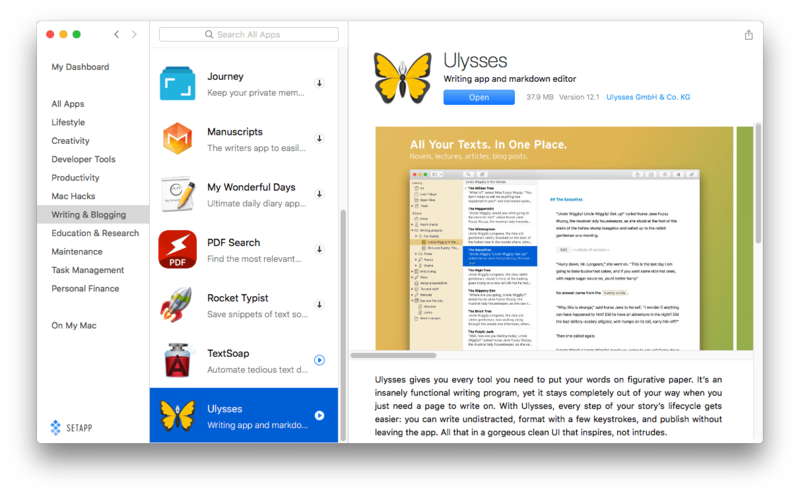 Using the example of Ulysses again, while I had started to use the app more and more, I was not compelled to upgrade to their new subscription. The value was not immediately obvious for my personal use case. It is a legitimate bug bear for users that across the board subscriptions have been a way to smuggle in price increases. I’m not somebody who thinks developers should make all of their labour gratis and live on crumbs, but I do understand where users have felt stitched up by the two-punch combination. The price increases have no doubt been the hardest part to swallow. Having the universal version of Ulysses included in Setapp has meant I don't need to weigh up it's importance to my workflow on its own. This is part of the problem, having to access every single app on it's individual merits is not always going have a favourable outcome. One would imagine the teething with this subscription situation will go on for some time. Macpaw have been smart in trying to address this brave new world with something different. Setapp makes a lot of sense where certain apps are concerned. In introducing subscriptions, at times the price points can appear almost arbitrary. Some apps have been wildly overpriced, and whether that is a legitimate mistake or not, it can easily look like an effort to find the breaking point of a user base. Smile is a good example of a company who tested the water and got burnt. To their credit, they were smart enough to realise what they had done, and so addressed it quickly. There are countless examples where developers have misjudged the situation. I just noticed Focus, a relatively simple pomodoro timer has just introduced a subscription. I can’t see it going well for the developers of that app. Pricing a glorified stopwatch at $4 per month is madness. This is just one way that something like Setapp becomes useful. Not having to make value judgements across every app and service a user might need makes a lot more sense for edge-case apps. Or indeed for software with marginal value. Being included in a suite with premium apps like Ulysses, 2do, RapidWeaver, Forklift, or Marked increases the value of useful, but lightweight utilities like Unclutter. When you can get all of that, and the dozens of other apps bundled with it for $5 a month, 1 who is going to pay $4 for an app made of a stopwatch and a list? There are many different user groups this service will suit, but I feel it could be particularly relevant to college students and academic users . My enthusiasm on behalf of students is due in part to the ephemeral nature of university life. Picking up a large software bill was once part of getting setup for university. Some colleges make that more palatable with group licensing. But that will cover an Office 365 subscription if you are lucky. A more custom, or unique workflow will have you reaching for the credit card. You may be investing in software that you will only use for a few years. Setapp could be a workaround for that situation. I have said it before, but it bears repeating. Whether we like it or not, subscriptions are here to stay. It is now a matter of trying to make the right calls that will minimise the damage to your pockets, while giving you access to the tools you require to get your work done.